Oceanic crust is primarily composed of mafic rocks, or sima which is named for its magnesium silicate minerals. It is thinner than continental crust, and is about 7-10 kilometers thick, however it is more dense, having a mean density of about 3.3 g/cm3. Oceanic crust generally does not last longer than 200 million years. In the rock cycle, it is continuously created at oceanic ridges. At these ridges, hot magma rises into the crust and cools, pushing the crust apart at the ridge. 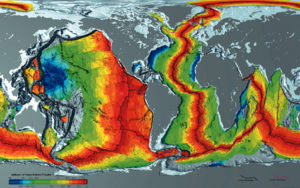 The continuous formation of new oceanic crust pushes the older crust away from the mid-ocean ridge. As it moves away from the ridge, the crust becomes cooler and denser, while the sediment may build on top of it. This page was last changed on 4 November 2017, at 15:26.